To see information on your links and who’s clicked, click Capture Apps in the sidebar and then Link Shortener. Beside any link you’ve created, click the Link Reporting icon. 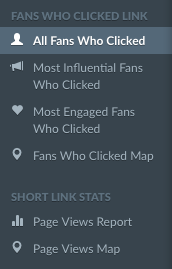 From here you can see a bunch of stats on your links, like traffic reports, all fans who clicked, and most influential and engaged fans who clicked. For all fan reports - we can only show you fans that clicked that have previously signed up to your contact list within Hive.co!